Modera Howell. Brand New Apartments in Dallas, Texas. NOW LEASING + up to 2 months free! What happens when you close your eyes and picture your perfect day? Do you imagine curling up in a comfy lounge chair by a pool? Hopping on a vintage trolley to explore the quaintest part of town? Taking a jog through a lush park? Or hitting up a hip, new cocktail lounge? Here at the new, one-of-a-kind Modera Howell, your perfect day can be everyday. 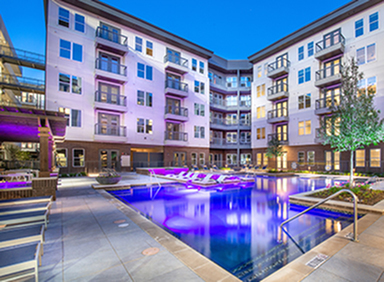 This exclusive six-story boutique apartment community set in Dallas' dynamic Uptown neighborhood features 190 studio, one-, two- and three-bedroom apartment homes surrounded by all the best Uptown has to offer. And that's a lot. Boasting 200+ restaurants, 160+ shops, and 50+ acres of green space, Uptown is more than a bustling community, it's an excitement-seeker's dream. And for those craving downtime, the luxurious amenities of Modera Howell are ready to set a new paradigm for Uptown apartment living. The community showcases a class A+ clubhouse with a social lounge and coffee bar, an outdoor serving area with gas grills, a high-tech fitness center, and sixth-floor sky lounge with sweeping views of downtown Dallas – a breathtaking spot to revel in the excitement of the Uptown scene. Of course, once inside, you'll find your apartment home reflects the luxury of its surroundings. Discerning renters will be pleased by its intelligent layout, spacious walk-in closets, full-size in-unit front-loading washers and dryers, vinyl-plank style flooring, granite countertops, premium 42" cabinetry, EnergyStar® Stainless Steel appliances, all topped off with fantastic views and high ceilings – idyllic for those with high expectations. Simply put, you don't move into Modera Howell, you move up. So if you are ready to have an abundance of amenities at your fingertips, sweeping views always within eyesight, and a plethora of world-class destinations out your door, you are ready to live it up with us in Modera Howell. Connect with us to make it yours.